These are filled with ground beef, millet, currants and Moroccan spices. So filling small peppers with tuna is really a big departure from my idea of stuffed peppers, but I love the idea of having them as a lunch or starter for a meal. The original recipe calls for piquillo peppers which are gorgeous little red peppers native to Spain. They were not available in my green market which was fine with me. Local peppers are in season and I'd rather by local produce. I wanted to make a big tray of these peppers because I thought that they would be perfect to bring to a party. They are single servings, bright and colorful, gluten-free and they taste good at room temperature. I adjusted the recipe to make a larger batch and to incorporate the tastes of my guests. The original recipe calls for a more intense amount of capers and olives that I knew would not go over well. The following is my version and I have to say... I could not stop eating these, absolutely addictive. The bright lemon flavor and the contrasting salty olive taste made each bite a serious flavor feast. My kids didn't love the peppers that much and spread the tuna on crackers which is a delicious alternative use for this wonderful tuna salad. 1) Spray the bottom of a large baking dish with olive oil. 2) Mix tuna, lemon zest and juice, shallot, olives, mint, EVOO, salt, pepper and capers together in a large bowl. Break up tuna chunks while mixing. 3) Cut the tops off and remove the inside stem and seeds of each pepper. 4) Stuff the tuna mixture into the peppers. Really pack them. 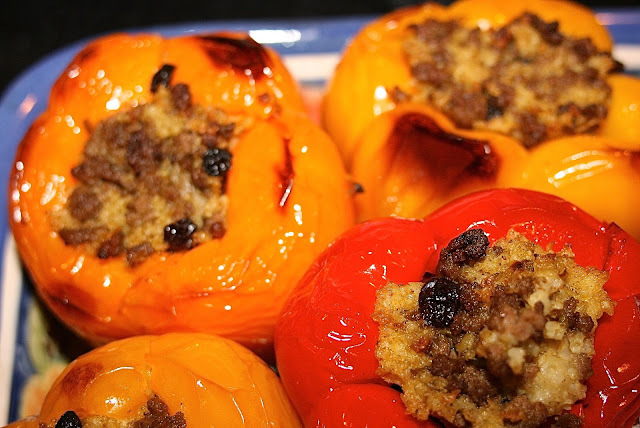 5) Put the stuffed peppers in your baking dish and brush them lightly with some EVOO. 6) Broil for about 10 minutes or until the peppers start to brown a little and the tuna is lightly heated. Tell me about it. I think I ate 6 myself. I used my leftover filling on toast and made a tartine of sorts - that was by far my favorite way to enjoy this. Nope - these sure don't look anything like the stuffed peppers my momma used to make! LOL... that's what I love about Dorie she takes us out of our comfort zone. I'm sure my mom would find these stuffed peppers down right strange. I am sitting in the Best Western Motel lounge in Denver waiting for the shuttle to the airport to catch the plane to Seattle. Since I am sitting here hoping to write this week's FFWD Post, I was happy to see yours pop up. I was able to find Piquillo Peppers at my local Whole Foods. Since my mom never stuffed a pepper in her Life, I am the first in the family to do it! Like you, I enjoyed these messy little darlings (I ate four). I also enjoyed the extra tuna spread on crackers. Wish you were coming to Seattle - always knew it wasn't possible but will be thinking of you and keeping you in the Loop. Thanks Mary... it sounds like quite a few of you are meeting up. I am going to meet Trevor at the end of Oct. He is visiting NYC. 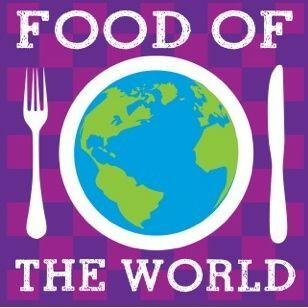 Remember if you ever come East I am always up for a foodie day in NYC. Have a wonderful time. These sound delicious. I was planning on skipping this FFwd but your review and Cher and Mary's comment has made me change my mind. Tanusree don't skip this one. It was easy to make and really delicious. I wasn't sure about this recipe, but I loved them, too!!! I love when a Dorie recipe surprises me. I wish I had thought to use local mini peppers. My CSA has them every week but for some silly reason I still mail-ordered the piquillo ones (which didn't seem that special). I'm so sorry they weren't special. I was going to look for them in the jar. A few people had them this way. I see you aren't in Seattle either. How is the baby doing? 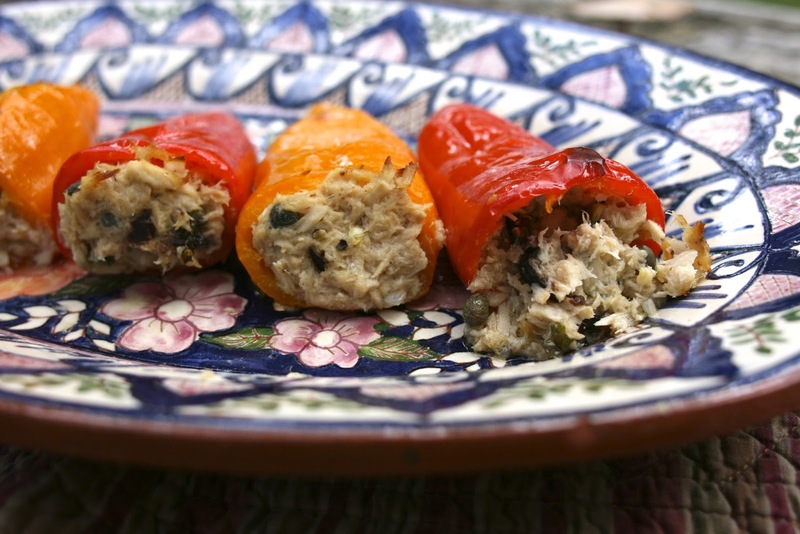 I'm always looking for interesting ways to use canned tuna (which I happen to love.) This looks so good. Thanks for sharing. Your are so welcome. If you like tuna you will find this addictive. I ate 4 in one sitting. I subbed fresh peppers, too - couldn't resist the tiny, purple, organic ones on sale at my food co-op! I've had the purple ones they are delicious. I haven't seen them this year? My half-Italian mother used to stuff peppers like yours at the top. I really liked the Mediterranean twist on tuna salad in this recipe, but preferred it spread on crackers rather than stuffed into peppers. It was definitely a bigger hit on crackers in my house too. It is great to have something this easy to through together. I always have a can of tuna in the pantry. These are beautiful peppers and looks delicious. Hope you are having a fantastic weekend and thank you so much for sharing with Full Plate Thursday! These sound wonderful Diane. I've been looking for new ways to use Tuna.